The various buildings, the château itself, the wine-buildings, the outhouses, flanked by the dovecote on the foundation, the sign of a noble mansion, all lie on the terrace on which they were built, beside the road at the foot of the slopes, opposite the plain. The estate, which is 16 hectares in size all in one piece, is almost entirely planted to vines. 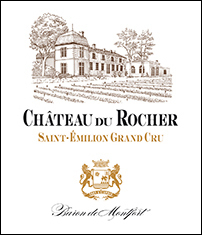 The subsoil, ferruginous in many parts, gives the wine a powerful sève in their early years but as they age they acquire all the organic finesse and the characteristic bouquet of « Saint Emilion ». This wine can be enjoyed now, or age in your cellar, and will be perfect with red meat and cheese.